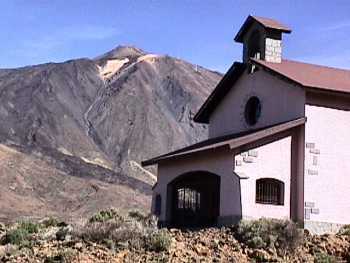 The Ermita de las Nieves (Hermitage of the Snows) and Pico del Teide. 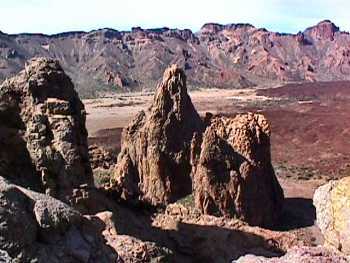 The entire 12-kilmoter diameter crater surrounding Teide is a national park and UNESCO world heritage site. 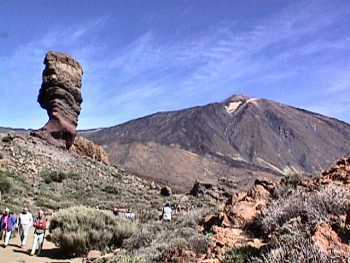 Teide is the highest mountain in Spain - 3715 metres. The hermitage is beside the Parador, a luxury hotel and the bus stop where we started our hike. Across the road from the Parador are Los Roques (the Rocks) or Roques de Garcia - I wonder who Garcia was. One of the bizarre ourcrops is called the Finger of God. 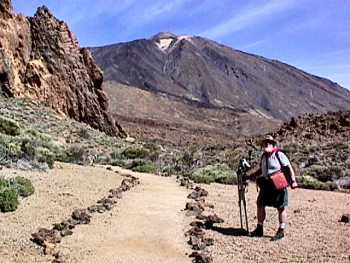 The trail around Los Roques is about 5 kilometres. Here at the beginning it was very easy going. That's Bill on the right, with all his camera and video gear. Bill among Los Roques. These are really BIG rocks - it must have been unimaginable forces to push the rocks up out of the plain. We are at about 2200 metres above sea level. 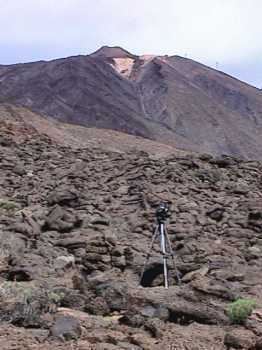 At the north end of the rocks, there is a lava flow coming down from Teide. Between the legs of the tripod, there is the entrance to a lava tube. This was quite a small one; some can be followed for more than a kilometer. This is the rock on top of a lave tube. 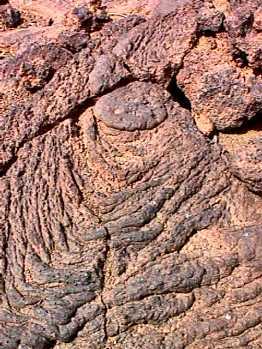 You can see how the flowing lava solidified. If you tapped on the rock it was hollow. 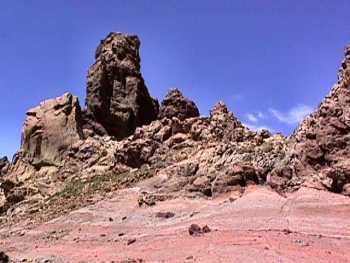 The outer surface had cooled and solidified while the inner, hot lava kept flowing, leaving a hollow tube..
Roques de Garcia. The different colours of the rocks was quite astounding - green, blue, red, orange, yellow, black. This rock is called the Cathedral. Behind it you can see the southern rim of the Canadas - a collapsed lava dome about 12 km in diameter and much older than Pico del Teide. Our trail took us past the foot of the Cathedral; then we had to climb all the way back up again. Las Canadas. 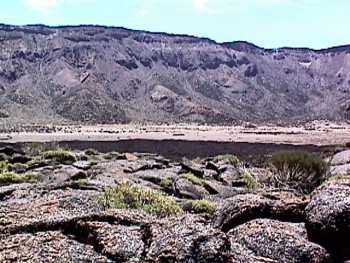 It looks flat but the lava is often piled up several metres high. It is really a lunar landscape. We made it back up to the top and our starting point, even though my hiking boot had started falling apart. I was really worried that I was going to be hiking almost barefoot over this very sharp lava. We thought we had seen all colours of rocks, until we came to these beautiful rose pink rocks. 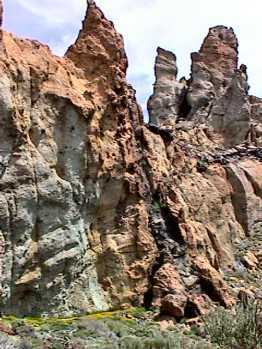 This outcrop is called the Yellow Rocks. 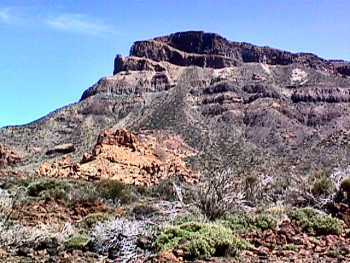 Behind it is Guajara, at 2700 metres, the highest point on the rim of the Canadas. We hiked past the Yellow Rocks a week later - close-ups then. 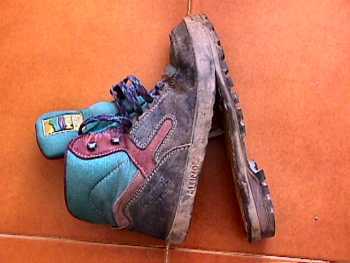 Just to show you the state of my hiking boot when I got home from Teide. Luckily I had another pair of stout walking shoes with me so we could still go hiking. 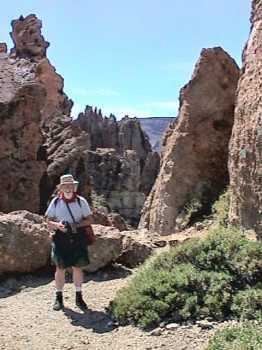 But we gave up our plan to hike the Masca Barranco (gorge) which is rated as difficult.